It's time for another sneaky peek with Your Next Stamp! 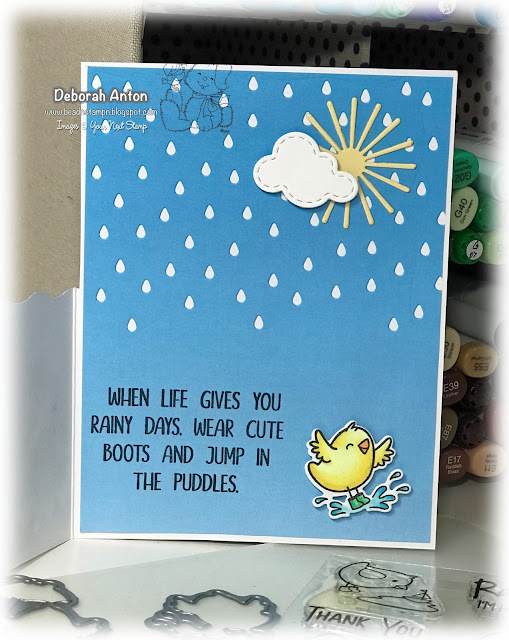 This March release is full of so much cuteness and uniqueness in the stamps and dies. Get your pen and paper ready to jot down all your favorites for tonight's release! For my peek, I am using the set of Puddles of Fun and decided to make this card a partial opening type card. I used some decorative scissors to create the wave top before adding the Chunky Grass die cut to the bottom. The image was stamped and colored in with Copics before using the coordinating dies to cut her out and pop her up. The first sentiment was stamped directly onto the top panel. 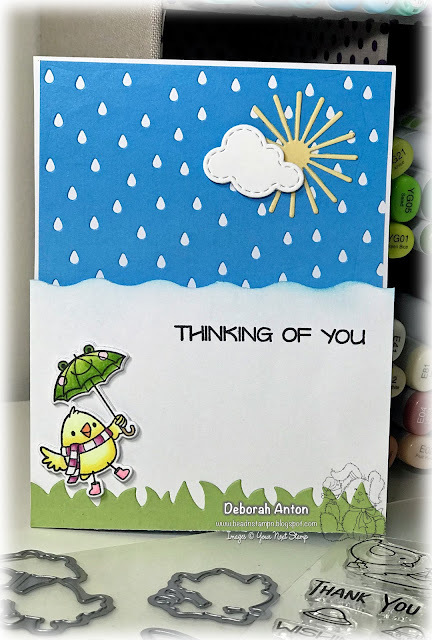 For the inside, I used the soon to be released raindrop die to create the background on a piece of blue cardstock. For the sun, I am also using a soon to be released die of Starbursts to create the sun and popped up a stitched cloud over it. I added another darling image to pop up and added the inside sentiment. Thanks for taking a peek today and hope you all have a warm and wonderful Saturday! Be sure to stop by the YNS Blog to see all the peeks and stop by tonight for our hop! Those chicks are too cute and I love the background die! What a lovely scene and a creative design! I just adore the sweet chicks. What adorable scenes you mde. Love them!